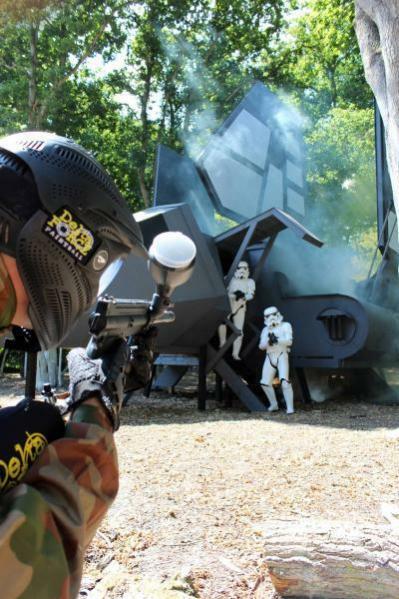 On Saturday 27th July 2013, Delta Force Paintball will be introducing to the UK its newest game zone addition; the out-of-this-world ‘Space Warz’. With approximately £40,000 being invested into this project, it really has to be seen to be believed! Based on the largest film franchise of all time we can reveal that the game zone scenario follows the exploits of a gunslingin’ smuggler and his hairy friend, a young boy with a particularly evil father and an intergalactic princess, all followed around by a couple of haphazard robots. Sound familiar? Our fantastic team of designers and builders spent several months constructing the props from scratch, keeping as true to the original film creations as possible whilst never forgetting to add certain modifications here and there to maximise the intensity of a classic Delta Force Paintball shoot-out. Our ‘Space Warz’ scenario (aka ‘Operation Rebel Scum’) features a Scout Walker, which players can climb up and shoot from, a 30ft high Imperial Shuttle accessible via its rear boarding ramp, and the infamous blast doors that hold the key to defeating the evil ‘Death Star’. 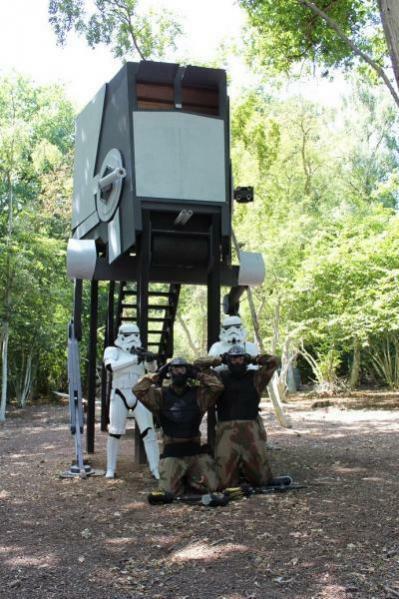 Set in our unspoilt woodland backdrop, it will feel as if you are really fighting the Empire in the penultimate forest moon battle; thankfully there is a distinct lack of small, chattering bears living in the tree canopy. A needless distraction when paintballs are flying at you! With the forthcoming Star Wars VII to be released later this year, now is the perfect time to switch into hyperdrive and come visit Delta Force Surrey. Interestingly, the producers are planning to shoot the film in the UK – we’ll be sure to get on to J.J. Abrams to see if he is up for using our totally unrelated game zone as a set in the new films!